Fourth Avenue is one of the primary shopping areas for Vancouver’s Kitsilano neighborhood. Kits, as locals call it, was hippy central 40 years ago, and it still retains traces of its history. 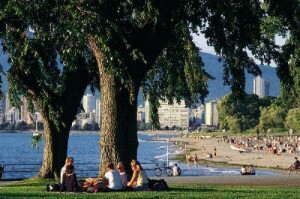 However, today Kits is one of Vancouver’s most desirable neighborhoods. It is especially popular with up-and-comers and hippies who made good. The atmosphere is laid back and casual. There are many young professionals and young families that live in the area. You will see quite a few people walking around in yoga gear as yoga is popular activity in Kits. Shopping along 4th Avenue is an eclectic treat. You’ll find coffee places, spas, two of Vancouver’s best high end restaurants, Bishops and Pastis, two great meat markets, two of Vancouver’s best bookstores, three children’s clothing stores and Terra Breads, Vancouver’s best bread bakery where you’ll discover some of Vancouver’s best sandwiches. 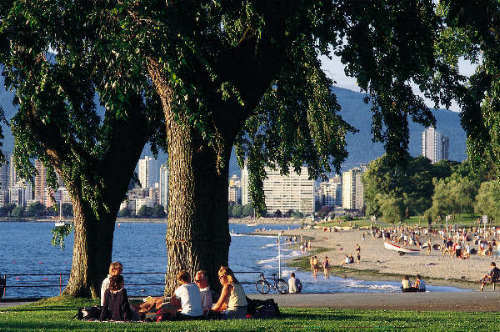 Vancouver’s Kitsilano neighborhood is easy to find. Go south across the Burrard Street Bridge then go west (right) at the end of the bridge onto Cornwall. Drive west on Cornwall to Balsam Street and turn south (left). Drive four blocks to 4th Avenue and park. You’ll be at the west end of the 4th Avenue shopping area. 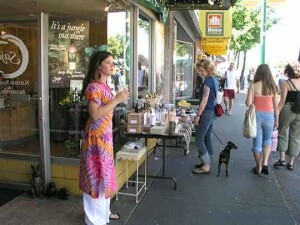 Semperviva – Kits Beach Studio (#110-2201 West 4th Avenue) – Popular yoga studio with a variety of yoga classes. Gravity Pope (2205 West 4th Avenue) – A unique selection of trendy shoes. The North Face (2136 West 4th Avenue) – High quality outdoor gear. Stylish designs. Sitka (1864 West 4th Avenue) – Casual clothing made from natural materials like organic cotton and bamboo. Pacific Boarder (1793 West 4th Avenue) – A good variety of surf, skateboard and ski/snowboard apparel. Spank (2066 West 4th Avenue) – The latest fashions for young women. Zulu Records (1972 West 4th Avenue) www.zulurecords.com – A great independent music store with a large selection of records and CDs. Briers Home and Gift (2070 West 4th Avenue) – A fun home decor and gift store with the latest designs. Ming Wo (2170 West 4th Avenue) – A high quality cookware and kitchenware store. Fourth Avenue has several children’s stores including Babes, a designer children’s store, Hip Baby, a baby emporium with everything for the 0-6 crowd including clothes, toys and furniture and Crocodile Baby, specializing in strollers, car seats, child carriers, car seats, diaper bags and children’s bedding. We can’t discuss Fourth Avenue without mentioning The Kitchen Corner. The Kitchen Corner, located at 1955 West 4th sells kitchenware, houseware, gifts, toys, and literally thousands of other things. The place is jammed with stuff from floor to ceiling on two floors. It’s a browser’s paradise. Whether you’re looking for a great restaurant for a special dinner or a place to stop, rest, refuel and contemplate your purchases, Fourth Avenue has just what you want. Here is a sample of the excellent eateries on 4th Avenue. Terra Breads Cafe (2380 West 4th Avenue) – Perfect for a light lunch or snack. 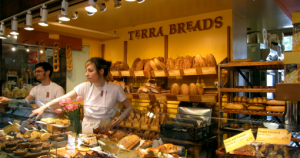 Terra Breads is a Vancouver institution. They make the best bread in the city and their cafe features delicious breads (Italian cheese, green olive and sourdough, to name a few), pastries (try their blueberry bread and Belgian chocolate brownie), soups and sandwiches. Grounds For Coffee (2565 Alma Street) – The most popular cinnamon bun in town! Many local cafes serve their buns, but be sure to visit this particular cafe to get them fresh. They are soft, gooey and will melt in your mouth. Viva Fine Foods and Bakery (1555 Yew Street) – Quaint cafe with friendly staff and over-the-counter service. Their sweets look good and taste even better! Taco Shack (1937 Cornwall Avenue) – Large portions and very fresh ingredients served by personable staff. Nando’s Flame Grilled Chicken (1955 Cornwall Avenue) – Easily the best chicken in town. It is grilled and served with your choice of sides. Scoop! Frozen Yogurt (2050 West 4th Avenue) – Tart frozen yogurt served with your choice of toppings and charged by weight. Their most popular topping is their mochi (made from glutinous rice). They are very light and marshmallow like – be warned, it’s addictive! their Montreal smoked meat bagel. you’re looking for something quick and cheap, avoid the regular fast food joints and check this place out. Vera’s Burger Shack (1925 Cornwall Avenue) – Award-winning burger joint that serves a variety of specialty burgers, hot dogs and sides. Wash it all down with one of their handmade milkshakes. Be forewarned. The portions here are big and you may want so start off with the idea of sharing something. The Naam (2724 West 4th Avenue) – Established vegetarian restaurant with a hippy-vibe. eclectic interior. Expect a line-up on the weekend. Bishop’s (2183 West 4th Avenue) – Established award-winning fine dining restaurant. There’s a reason why they have been in business for over 20 years! quality sushi and cooked foods.